Lock in a great price for Sunshine Hotel – rated 8.8 by recent guests! 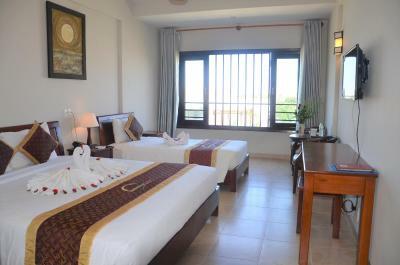 Very large rooms, comfortable bed, amazing view from 4th floor balcony. Staff was welcoming very pleasant and very welcoming. Good breakfast and beautiful pool area. Highly recommend this hotel. Outstanding value for your money. The pool was great- a good length compared to other pools other hotels offer. You could actually swim in this one as opposed to just a soak. The bedroom was good and bed comfy. The hot Breakfast is selection was ok but the fresh fruits were very good. It’s good they give you a free bicycle. Great value for money, very comfortable beds and spacious family room. Great location between the beach and old town. Easy to get around with the free bikes. We liked everything about the hotel.. Really good value hotel , very friendly staff, nice breakfast , nice room ..
Clean, comfortable, great location. Pool was lovely. Staff at sunshine were wonderful! 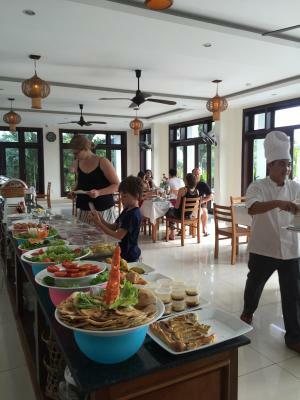 Great staff, clean quiet comfortable rooms, lovely pool, great breakfast!!! After staying in Hanoi, we felt like this hotel was lugs luxurious. The room is large spacious the windows openwe and you could get a nice breeze. Our room looked over the pool and face the street, and it wasn’t terrible view. Front desk staff were friendly, and so were the people who did massages. Massages were nice and a Great price, but don’t expect to have privacy when changing for your massage! This hotel is a little bit out of the old town, but I thought it was an enjoyable walk. If you don’t want to walk the hotel offer shuttles just about every hour all day long. Sunshine Hotel This rating is a reflection of how the property compares to the industry standard when it comes to price, facilities and services available. It's based on a self-evaluation by the property. Use this rating to help choose your stay! 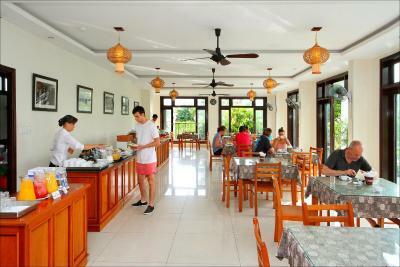 Sunshine Hotel is located a 15 minute walk from Hoi An Ancient Town, a UNESCO World Heritage Site. 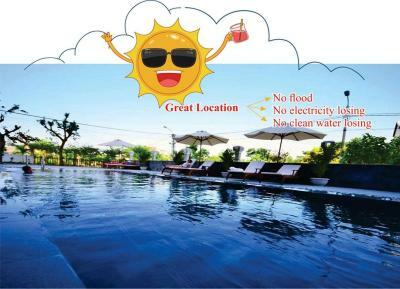 This hotel offers an outdoor pool and rooms with free wired internet. Free Wi-Fi is also provided throughout the building. 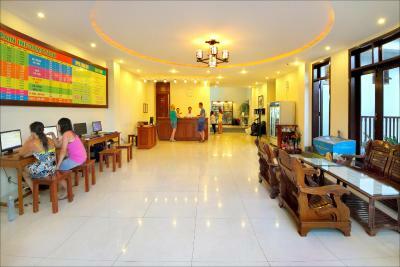 Hotel Sunshine is one mile from An Bang Beach and a one-hour drive from Da Nang International Airport. UNESCO World Heritage Site, My Son Sanctuary, is 37 miles away. 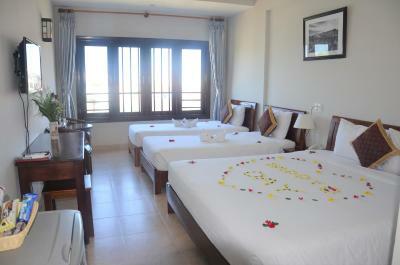 Rooms offer grounds or pool views, with select rooms having a balcony. A satellite TV, minibar and electric teakettle are provided. Some rooms come equipped with a flat-screen TV. Bicycles are available for free for guests wishing to explore the surroundings. The tour desk can make sightseeing arrangements or provide currency exchange services. Laundry and dry cleaning services are available. 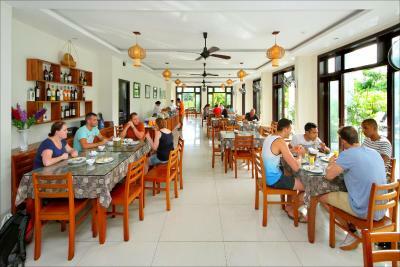 A selection of Western and Asian dishes are served in the restaurant. Drinks are offered in the bar. When would you like to stay at Sunshine Hotel? Offering a private balcony with garden views, room comes fitted with a safe, flat-screen satellite TV. 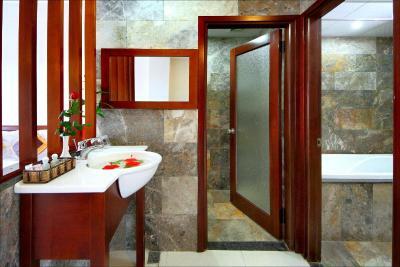 A separate bathroom features both a bathtub and standing shower. This quadruple room has a hot tub and offer a larger window with pool views, electric kettle and air conditioning. A room for 3 pax, offering a private balcony with garden views. This room has a separate bathroom and toilet. Bathrooms have both a bathtub and a standing shower. Room can accommodate an extra bed. Extra bed charges apply. House Rules Sunshine Hotel takes special requests – add in the next step! Sunshine Hotel accepts these cards and reserves the right to temporarily hold an amount prior to arrival. 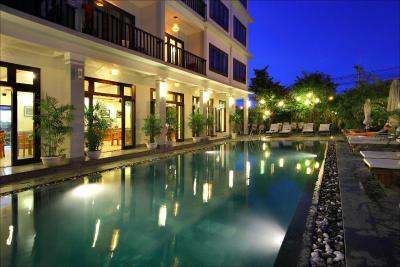 Great hotel in an ideal location to explore Hoi An. Lovely pool and free bike rental was a bonus. Breakfast was good with lots of variety. Rooms are big and spacious, ours had a balcony which was a treat. Shower was amazing, powerful and hot. This is our second stay at the Sunshine Hotel. The first time we came for three days and stayed for seven. This time we came for six days. We love everything about this hotel. The wifi is reliable; the pool is stunning; the breakfast is varied and delicious; the rooms are clean, air conditioned, and the bathroom is very modern. We were here five years ago and were not sure what the hotel would be like five years later - but it was even better than we remembered! The staff are amazing, and helpful. They booked taxis, massages, airport transfers and tours for us. They were lovely and kind. No request was an imposition. The hotel is located just out of the old town, but just a 50,000 dong (less than $3) taxi ride into town (or a 15 minute walk) - also close to An Bang Beach. The value for the price is amazing. 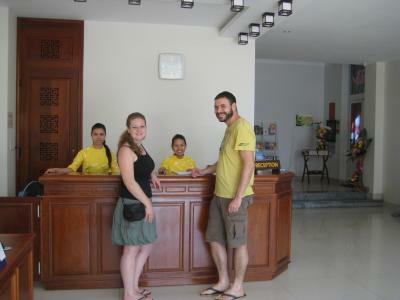 We recommended it to people we met in Hue, and they were delighted when they arrived. Seriously this hotel is amazing!! The walk into the Old Town is far so I’d always recommend the use of the bicycle. The hotel should try to encourage less use of plastic as opposed to trying to give new bottles everyday. Cleaning can me done a bit better. We had to ask for shower gel and shampoo. For westerners that are used to pay for bills with your credit card, be aware that the property will add a 3% charge for using a credit card. This should be stated in the property policy. 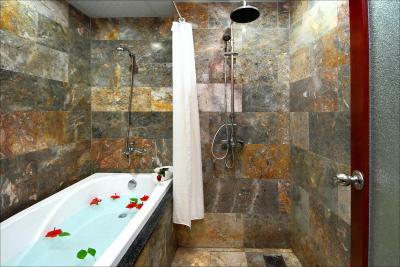 The hotel was extremely clean and seemed like it was either kind of new or recently renovated. Staff very friendly. Nice pool. Complimentary water every day. Good cleaning service. Good restaurants nearby (Silent Garden!!!). A short walk from the old town but a nice distance from all the noise. A little oasis in that sense. Great hotel with very good service and helpful staff. We spent there two nights and we definitely recommend this hotel to other tourists. During hot days the swimming pool is an excellent option . The staff went above and beyond to help us. They gave us tips on how to stay safe, information on areas to go and the trip that we booked through them was effortless. If you are a group of young people, (we were three girls) then this is the hotel for you! The free bikes were fantastic as the hotel was fairly close to the beach. Wonderful hotel with an amazing pool and awesome breakfast! The staff was so helpful and booked our bus for us. They did everything to make our stay perfect, definitely my favorite stay on my Vietnam trip! Everything there was perfect. The pool was awesome! I also love it that the staff was very friendly, polite and took a good care of us. All in all, highly recommended! Excellent value for money ( swimming pool, free bicycles ) Friendly and helpful staff. Spacious balcony room for only 22 US dollars a night. We cannot fault this hotel! Room was immaculate, staff were so friendly and helpful and breakfast and the pool were such a good added bonus! !